PA officials criticize reports that Trump is planning to recognize Jerusalem as Israel's capital. Palestinian Arab officials on Friday criticized reports that U.S. President Donald Trump plans to recognize Jerusalem as Israel’s capital. 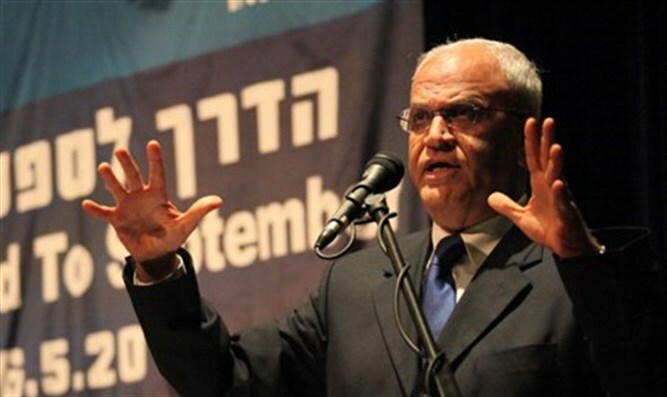 Saeb Erekat, Executive Secretary of the Palestine Liberation Organization (PLO) said, "Any American recognition of Jerusalem as the capital of Israel will bring about the end of the Jerusalem issue. This issue is weighty and dealing with it is playing with fire." Nabil Abu Rudeineh, a spokesman for Palestinian Authority (PA) chairman Mahmoud Abbas, said that any just solution in the Middle East required recognition of east Jerusalem as the capital of an independent Palestinian state. "East Jerusalem, with its holy places, is the beginning and the end of any solution and any project that saves the region from destruction," he said in a statement on the PA’s official Wafa news agency. Earlier on Friday, an unnamed official in Washington told the Reuters news agency that Trump is expected to deliver a speech on Wednesday recognizing Jerusalem as Israel’s capital, a senior U.S. official said on Friday. The comments follow a report on Thursday indicating that Trump was considering recognizing Jerusalem as the capital of the State of Israel as a gift to Israel on the occasion of its 70th Independence Day. Two administration officials said, however, that even as Trump was considering the declaration of Jerusalem as the capital of Israel, he was expected to again sign the waiver delaying the U.S. embassy from Tel Aviv. On Wednesday, reports in Israel said that senior officials in Jerusalem said that the Israeli government expected an announcement from the White House in the coming days, announcing the embassy move and the formation of a special team to implement the move. White House press secretary Sarah Huckabee Sanders later denied that any such announcement was imminent. State Department spokeswoman Heather Nauert similarly said on Thursday that no decision had yet been made on moving the U.S. embassy in Israel from Tel Aviv to Jerusalem.